Those devoted to Me are calling Me. The task for which I came is yet unfinished. Character will confer power then, not knowledge or inventive skill, not wealth." On the 20th of October, 1940, the day after they all returned from Hampi by special bus, Satyanarayana started for school as usual. The Excise Inspector of the place, Sri Anjaneyulu who was very much attached to the little Baba, accompanied him as far as the school gate and went home, rather reluctantly. He seemed to see a superb halo round the face of Baba that day and he could not take his eyes away from that enchantment. Within a few minutes, Baba too returned back to the house. Standing on the outer doorstep, he cast aside the books he was carrying and called out, "I am no longer your Sathya. I am Sai." The sister-in-law came from the kitchen and peeped out; she was almost blinded by the splendour of the halo, which she saw around Baba's head! She closed her eyes and shrieked. Baba addressed her, "I am going; I do not belong to you; maya has gone; my bhaktas are calling me; I have my work; I can't stay any longer." And, so saying, he turned back and left in spite of her pleadings. The brother hurried home on hearing all this; but, Baba only told him, "Give up all your efforts to 'cure' me; I am Sai; I do not consider myself related to you." Neighbour Sri Narayana Sastri heard the noise; he listened and realized that it was something serious; he ran in; he saw the splendour of the halo and fell at Baba's feet. He too heard the historic declaration, "Maya has left; I am going; my work is waiting." Seshama Raju was non-plussed; he could scarce collect his wits to meet this new situation. A boy, just fourteen, talking of bhaktas, work, maya and the philosophy of belonging! He could think of only one plan: Sathya was entrusted to him by the parents and therefore it was his task to inform them; Sathya could leave the house, only after they came to Urvakonda. But, Sathya would not step into that building again; he moved out into the garden of the Excise Inspector's bungalow, and sat on a rock, in the midst of the trees. People came into the garden from all directions bringing flowers and fruits; the tope resounded to the voices of hundreds, singing in chorus the lines that Sathya Sai taught them. 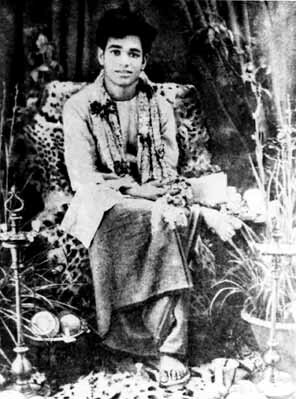 The first prayer that he taught them that day was, as many still remember, Maanasa Bhajare Guru Charanam Dustara Bhava Saagara Taranam. Meditate in the mind on the Feet of the Guru; that can take you across the difficult Sea of Samsaara. His classmates wept when they heard that Sathya will no longer attend school, that he was much beyond their reach, that his company was hereafter only for those upon whom he showers his grace. Many came to the garden with incense and camphor to worship him. Some came to sympathize with the family, some to congratulate them. Some came to learn and some, alas, even to laugh! Three days passed thus in that garden; three days of bhajan and naam sankeertan. A photographer came with a camera; he wanted Baba to remove a crude stone that was right in front of him but Baba did not pay heed to that prayer. He clicked nevertheless and lo! As can be seen from the picture of that photograph given in this book, the stone had become an image of Shirdi Sai Baba! but only in the photograph, not for all assembled there.